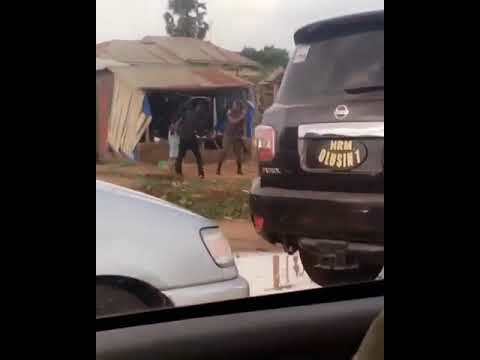 A video showing policemen attached to a Kwara monarch, the Olusin of Isanlu Isin, Oba Solomon Oluwagbemiga Ayodele, flogging a motorcyclist was at the weekend trending online by a social media user. The video shared via Insgtagram @oluwalodiwamu was captured while the Olusin, a first class monarch from Isin Local Government Area of Kwara State was on transit. It was however not revealed whether the flogging of the motorcyclist was carried out with the consent of the traditional ruler. ”What is happening in Nigeria with the so called policemen/SARS! I was in a little traffic along the uncompleted road of Ajase-Ipo/Ilorin when I saw a bike on motion running towards the drainage and later jumped to escape the chase by Olusin of Isanlu Isin’s entourage which happened to be Nigeria police men. He left his bike by the roadside and while the monarch’s entourage were about carrying it away, he surfaced, begging but they were not yielding as they started beating him mercilessly.